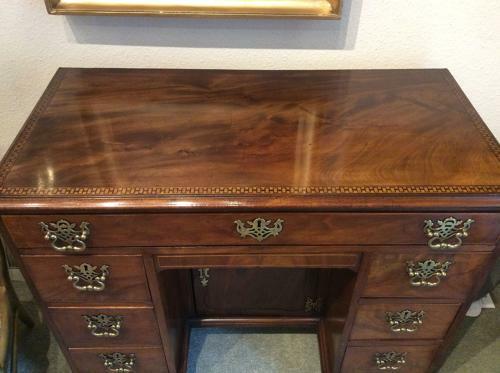 Georgian mahogany kneehole desk, the top with a chequered inlaid band, over a long drawer, a concealed frieze drawer, and three drawers to either side, all drawers oak lined and fitted with swan neck brass handles and plates. Fitted recessed cupboard with shelf to the interior and working lock. The whole supported on bracket feet. Circa 1800.